Great grades just got easier. PerfectNotes® turns the classes you attend into the A-Grades you deserve. PerfectNotes® ensures you leave every class with a dynamic and grade-raising record of what you heard, what you thought and... just as important...what you missed. 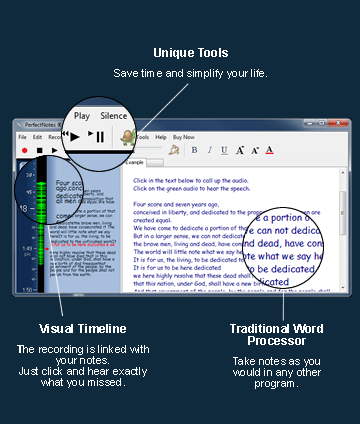 PerfectNotes® software—A lecture recording and note taking tool for great grades. Easily go back through your recording and your notes then and there...at home that night ...or weeks later when you're reviewing for exams. With PerfectNotes®, the class is there for you again whenever you need it... guaranteeing you Perfect understanding. Visit our blog. Current story: "PerfectNotes Provides a Wonderful Life"
Read our current press release. "Microsoft OneNote Competitor Announces Newest Release"
How well you do depends on how much you understand from your classes and lectures. Ordinary note taking distracts you from what's being said and makes it hard to ask questions or take part in discussions. PerfectNotes® gives you your own, easy to access multimedia record of every word spoken in every class... along with every point, idea and question you noted at the time.